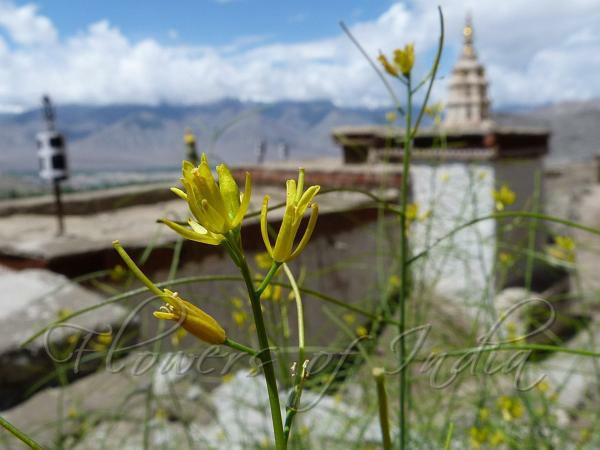 Himalayan Tumble-Mustard is an annual or biennial herb, 30-100 cm tall, erect, branched, nearly hairless. Lower leaves are cut into many lobes like Dandelion leaves, rarely entire, shortly stalks, terminal lobe ovate-oblong, distantly toothed. Lateral lobes are smaller but similar, toothed to sub-entire. Upper leaves gradually become smaller and linear, stalkless. All leaves somewhat fleshy. Flowers are borne in 20-50-flowered sparse racemes, up to 25 cm long in fruit. Flowers are about 5 mm across, yellow. Flower-stalks are 5-10 mm long in fruit, spreading horizontally, slightly thickened. Sepals are 3-4 mm long. Petals are 6-8 mm long, 1.5 mm broad. Stamens are 3:5 mm long, anthers about 1.5 mm long. Seed-pods are linear, somewhat cylindrical, slightly downcurved, horizontally spreading, 5-10 cm long, 1 mm broad, hairless. 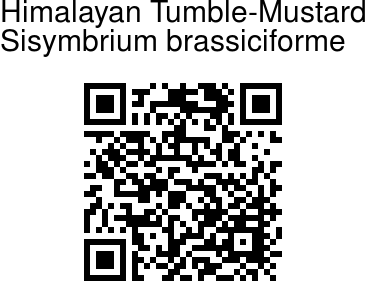 Himalayan Tumble-Mustard is found in C. Asia and Himalayas, in Tibet, Kashmir, Ladakh Pakistan and Afghanistan, at altitudes of 900-4500 m. Flowering: May-July.